Ever attended a conference and looked around to see how many people are not engaging in the real but are situated in the virtual and have their face pressed into a screen? Well next time you are answering your email at a keynote, a meeting or on public transport, STOP, lift your eyes above the screen and take in the scene. There will be many people, like you, locked into their personal virtual network within the real network, possibly ‘alone in the crowd’. At one point, Turkle (1996), in her ‘Virtuality and its Discontents’ article that discusses community spaces in gaming environments. Back in 1996, the researcher suggests that in the future a utopian view will prevail as virtual experiences and virtual communities will be a way that communities will broaden their horizons. However, Turkle offers her imagined future of virtual communities and considers the scenario ‘by sitting alone in our rooms typing at our networked computers and filling our lives with virtual friends’ (1996: 52). 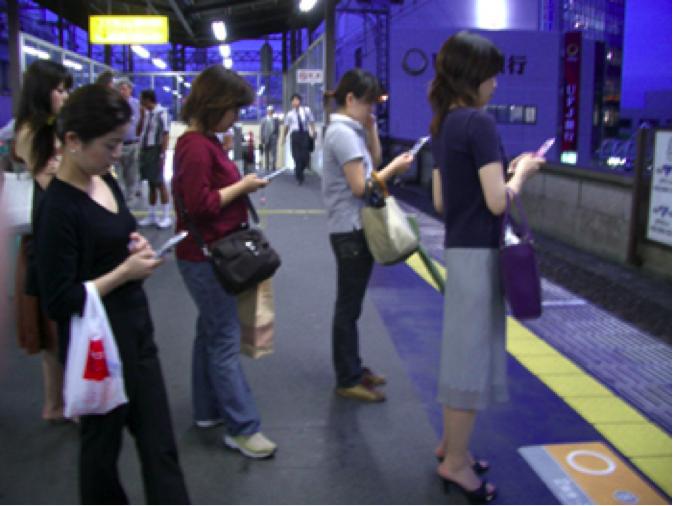 The reality being that mobile devices enable society to sit side-by-side engaging with our virtual friends. Turkle’s (2011) more recent work ‘Alone Together’ continues her observations within these ‘elsewhere’ spaces, looking at the ways social networking and texting cultures are changing how people relate to society and their personal networks. Importantly there are now generations that have always been connected and are not familiar with sitting with themselves. It can and has been argued that the boundaries of our spaces are slowly eroding, even eroded in some instances and society is firmly tethered to our mobile devices. So should we start to schedule times to unplug, turn off, untether? How do you mediate your virtual and real worlds? Do you actively manage your different networks or are you not too concerned about how they merge. Turkle, S. (1996) Virtuality and Its Discontents, The American Prospect, Winter, 50- 57. Turkle, S. (2011), “Alone Together: Why We Expect More from Technology and Less from Each Other”, Basic Books, London.